There was a time, in the not too distant past, when a doctor needed to see what was going on inside your body he would have to perform exploratory surgery. This meant putting you under general anesthesia, cutting you open, and rooting around inside you to determine what was wrong. Exploratory surgery was generally used to diagnose and locate cancers, but doctors also used it for other disorders, like aneurisms. Exploratory surgery is still sometimes used, when necessary, but has largely been replaced by diagnostic scans, such as CT Scans, MRIs, ultrasound, and others. Why Use a Diagnostic Scan? The big issue with exploratory surgery is that it is invasive and potentially risky. Going under anesthesia puts some strain on your body, and the longer you are under, the greater the risk that you will have a bad reaction to the anesthesia. There are also risks of other complications from surgery, such as infection, bleeding, and damage to the surrounding tissues. Additionally, if you undergo exploratory surgery, you will have to deal with post-surgery recovery time whether the doctor finds anything or not. In comparison, diagnostic scans are minimally invasive. Most scans also do not require anesthesia, and they don’t break the skin, so there are very few risks or complications like infection. There is also no recovery time involved after a diagnostic scan. Most procedures can be performed in your doctor’s office, or a scanning facility, and you can return to your daily activities. There are five major types of diagnostic scans: X-rays, nuclear medicine, magnetic resonance imaging (MRI), ultrasound, and endoscopy. 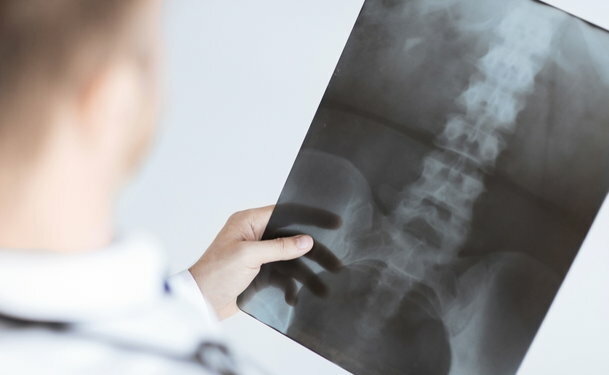 X-rays use electromagnetic waves to take a two-dimensional image of the inside of your body. A simple x-ray machine takes one image at a time. More advanced scans (like a CT scan), takes multiple images. X-rays work best on dense tissue and bone, but they also detect some areas in soft tissue, like the lungs or breasts. X-rays can sometimes detect abnormalities in other soft tissues, such as your blood vessel or intestines. Nuclear medicine involves scans, like the CT scan, that pose some radiation exposure. These scans are often done in conjunction with radioactive material as a contrast dye (that you eat, inhale, or have injected into your body), while a special camera watches the substance pass through your body. Nuclear medicine is best for observing the shape and function of your major organs, such as your lungs, intestines, or heart. These scans can also detect some cancers, injuries and infections. The MRI uses magnets and radio waves to take multiple images of your body. MRIs work on soft and dense tissue and can diagnose a variety of illnesses. MRIs are especially useful in viewing brain tissue and the spinal cord. Because MRIs use powerful magnets, individuals with metal inside their bodies, such as replacement joints, plates, or shrapnel, should not use them. Neither should individuals with surgically-implanted electrical devices, like pacemakers. An MRI does not expose you to radiation. Ultrasound uses high-frequency sound waves to take images of your body. Ultrasounds work best on soft tissues, and doctors use them do diagnose tumors and other abnormalities in all the soft tissues in your body. Doctors also use the ultrasound to track pregnancy. The ultrasound is one of the few diagnostic scans that pregnant women can use safely because they do not use any radiation. Endoscopy uses a camera attached to a long tube to take pictures of the inside of the body. Endoscopy is generally used on organs that have an opening to the outside world, such as your lungs, urinary system, or digestive tract. However, a doctor can also insert the camera through a small incision to look at an enclosed area, like your knee joint or abdomen. Endoscopy procedures are a little more invasive than the other types of diagnostics because the doctor actually has to stick the scope inside your body. Additionally, you might need to be mildly sedated during the procedure. However, endoscopy is still much less invasive, has fewer risks, and has a shorter recovery time than exploratory surgery to reach a diagnosis.